Soybean rust (SBR), caused by the fungus Phakopsora pachyrhizi, is one of the most important diseases of soybean in several regions around the world. The pathogen was first identified in Asia but later spread to Africa (1997) and South America (2001). The first report of SBR in the continental United States occurred in 2004, most likely brought from South America by the winds of Hurricane Ivan. It has been proposed that the widespread adoption of soybean as a crop around the world may have contributed in part to this movement. It should be noted that at the end of the 2016 field season, SBR has yet to be detected in Ohio. The pathogen does not typically overwinter in areas with freezing temperatures. However, it can be spread over long distances by wind in storm fronts. SBR can spread quickly within a soybean field under favorable conditions and can cause severe defoliation. In regions where the disease has been reported, yield losses ranged from 10 to 90 percent. In Alabama, yield losses of up to 60 percent have been observed in commercial soybean fields. Underside of a leaf with symptoms and signs of soybean rust (A). Close-up of soybean rust pustules (B). Phakopsora pachyrhizi is an obligate parasite, meaning that it is not able to survive outside of living host tissue. Soybean and kudzu are the most common host plants in the United States. There are more than 90 additional legume hosts known for this pathogen. Phakopsora pachyrhizi is a microcyclic rust, meaning that it only produces two types of spores: urediniospores and teliospores. Urediniospores are pale yellow-brown to salmon colored and have some ornamentation on the surface. They are the only spore stage known to infect host plants. Urediniospore masses can be seen within the pustules on the underside of leaves using a 20x hand lens. Teliospores are black and are produced in old lesions, however, their contribution to the disease cycle is unknown at this time. 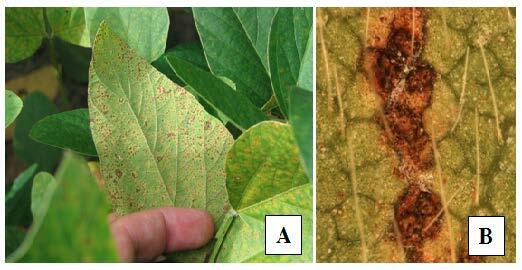 Symptoms of rust in the lower canopy of soybean plants (A). 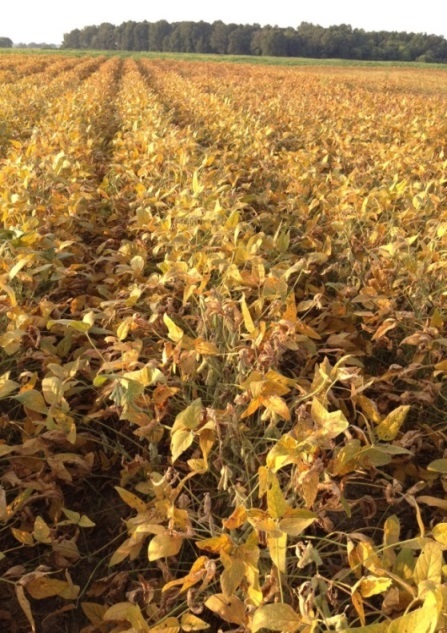 Soybean field severely affected by soybean rust in Alabama, U.S. (B) (Photo courtesy of Dr. Ed Sikora, Auburn University). The first symptoms of SBR are very small tan to brown and brick red spots on leaves. Brick red lesions may be associated with moderate resistance responses in some hosts. Leaves can be held against a light source to see the lesions. Pustules are formed in lesions on the lower leaf surface and they contain the urediniospores. SBR is most often found in the lower canopy at or after flowering stage and can rapidly progress upward into the upper canopy. Leaves on heavily infected plants turn yellow and die, and plants defoliate prematurely. Urediniospores can be spread by wind. Kudzu, a weed host of SBR, serves as an overwintering bridge host between soybean crops in the southern United States, Mexico and in the Caribbean Basin. In the United States, the pathogen typically overwinters along the Gulf Coast in Florida, Alabama, Louisiana and Texas. The inoculum that can potentially affect soybean in Ohio must come from over-wintering sources that are hundreds of miles away. Interestingly, urediniospores of SBR are very sensitive to ultraviolet radiation which causes spores to lose their viability. Any movement of viable spores would have to occur during stormy conditions where clouds and moisture help protect them, much like what occurs during a hurricane. After spores land on a leaf surface, they germinate within 12 to 14 hours under wet conditions coupled with temperatures between 60 to 78 degrees Fahrenheit. Spots on leaves can be visible within four days after infection and pustules will appear within 10 days and produce spores for approximately three weeks. Onset of SBR in the United States depends on where the fungus overwintered (how far north), how much inoculum overwinters and if favorable environmental conditions occur early in the growing season for build-up of inoculum. Another factor that has limited the development of this disease in the southern United States in most years has been the predominance of hot and dry summers in this region. This appears to slow disease progress until cooler conditions prevail later in the growing season. Therefore, careful and diligent scouting of both soybean fields and kudzu patches in the southern states has been extremely important for determining the threat of this disease for Ohio and other Midwestern states. 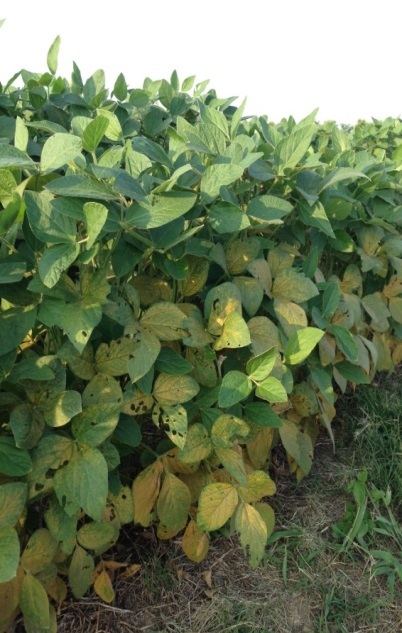 From 2005 to 2016, soybean producers in Ohio have not had to consider managing this disease. In 2012, an area of over 200 hectares of soybean in Alabama reported losses of over 60 percent due to SBR (Sikora et al. 2014). Soybean fields with the greatest yield loss did not receive a fungicide application or were treated too late. Therefore, properly timed fungicide applications would avoid greater losses. 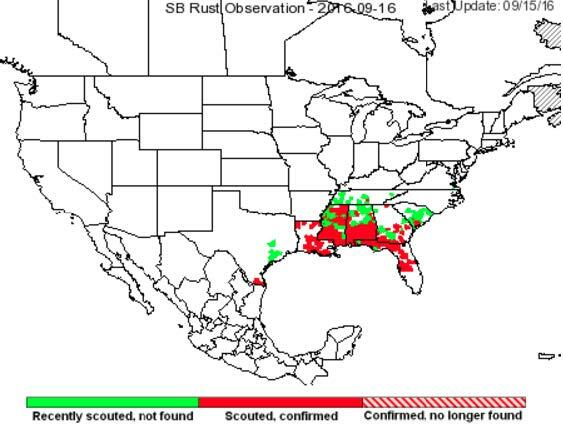 The risk of soybean rust in Ohio is monitored each year by checking the distribution of SBR in the Southern United States. The best time to do this is when Ohio soybeans begin to flower. Monitoring systems have been used to detect the presence of inoculum in soybean growing regions in the south. Land grant universities and the United Soybean Board collaborate to maintain a network of sentinel plots across the United States. These sentinel plots include naturally occurring kudzu patches or soybean plots planted weeks before commercial soybean fields are typically established in an area. The sentinel plots are scouted weekly for SBR and act as an early warning systems for growers in that region. Observational data is collected from each plot and uploaded to a central site which then provides real-time maps showing rust activity across the country. Information about sentinel plots can be found at sbr.ipmpipe.org/cgi-bin/sbr/public.cgi. If SBR is identified in Ohio prior to the R5 growth stage, fungicide application would be recommended to prevent potential loss in yield. Strobilurin and triazole fungicides are the two classes that are currently recommended to control SBR. Sikora, E. J., Allen, T. W., Wise, K. A., Bergstrom, G., Bradley, C. A., Bond, J., Brown-Rytlewski, … & Zidek, J. E. 2014. A coordinated effort to manage soybean rust in North America: a success story in soybean disease monitoring. Plant Dis. 98:864-875.